Howdy from the Design Team at Beaducation! Today we are going to be working with blanks and leather cuffs to create a bracelet that is totally on-trend. We call this free project "Stamped Sliding Blanks on Leather." This design is versatile enough that you can create any number of designs with the same basic technique. We are going to show letter stamping with some embellishments and then walk you through how to put it all together. For a full list of tools and materials needed to make this bracelet, check out the project page in the DIY Designs section at Beaducation.com. Let's get started! 1. Line up all the blanks and make sure they are even and level with one another. We have chosen these copper rectangles for our project. If you are working with multiples, feel free to tape down the edges to keep them from moving around. 2. Lay the leather cuff over the blanks and use a Sharpie pen to mark a line at the top and bottom, where the bracelet hits the blanks. 3. Select a letter stamp from the set you will be using and center it on the first blank, just to gauge where you will line them all up. With a ruler, draw a line where you want your letters positioned across all the blanks. Below is a picture showing the two lines that mark where the bracelet goes, and the middle line that guides the letter stamps. 4. With all the blanks neatly marked, stamp the blanks as you usually would. If you are new to stamping, check out our FREE online tutorials that will teach you this technique. 5. After stamping the letters, stamp any additional design stamps to embellish the piece. We used this Fat Lined Heart Stamp in our project. Then oxidize and polish everything while the blanks are flat; it's easier to do this now. If the lines noting where the blanks fit on the leather cuff get polished off, just mark them back in. 6. Take a pair of metal shears and trim off approximately 6mm from one end of the blank, then file the edges so they are smooth. To be consistent, we trimmed the same side on all the blanks. This particular blank will overlap itself on the back side if it is not trimmed. The overlap can make it difficult for the bracelet to lay completely flat. 7. With a pair of flat nose pliers, grab the blank just to the outside edge of the Sharpie marking, taking care that the edge of the plier is right up against the line. It is better to have your sliding blank be too big rather than too small. While holding the blank securely, bend the marked portion of the blank with the pliers into an acute angle (slightly tighter than 90 degrees). 8. Bend the other side of the blank the same way as the first. Continue to bend all the blanks so they are prepped and ready to be added to the bracelet. After the blanks are bent, polish off the marker lines using your Pro Polish Pad. 9. 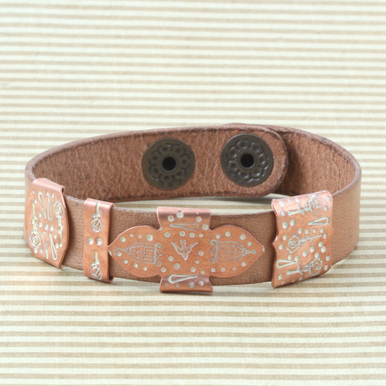 Work the leather bracelet in between the angles of the blank. With a pair of nylon jaw pliers, apply pressure to one side and then the other to secure it on the cuff. If you want the blank to slide, do not apply too much pressure. If you want the blanks to stay put, clamp down harder to keep them in place. Keep going! 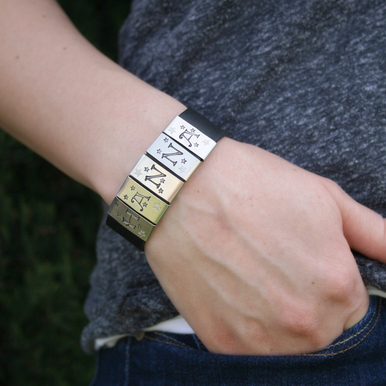 Below you can see what the back side of the bracelet can look like. Depending on how precise the measurements are, the back side can line up evenly too. The most important part is to file the edges so the blanks wear comfortably against the wrist. Viola! Below is the finished piece. With Mother's Day coming up, we thought "MOM" was a good word to stamp, and it's versatile in the sense that you can just flip it over and it says "WOW." Don't forget to check out our DIY Designs page for additional FREE projects to help inspire you and get your creative juices flowing. We hope you have fun with this project! What are the best metal to bend? I'm looking for one that not too expensive. Instead of a leather though, I want to bend around another metal. If you are going for inexpensive, I'd look at aluminum, brass, and copper. Please let us know if you have any additional questions!